Acti Vera works from the inside out making the inside of a plant stronger and working magi..
What is Alg-A-Mic™ ? Alg-A-Mic™ destresses the plant after overfeeding, deficiencies, plant disea..
Bio-Bloom™ is a complete liquid organic fertilizer which contains a small amount of nitrogen and eno..
What is Bio-Grow®? Bio-Grow® is a liquid growth fertilizer which can be applied to most types of ..
BioBizz Bio Heaven is an all-organic biological stimulant for your plants. 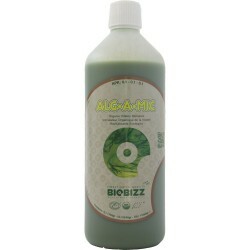 Created from natural prot..
Biobizz Fish-Mix has always been a trusted friend to the organic gardener because it conditions the ..
Biobizz Root-Juice is a 100% vegetable based root stimulator which creates explosive root growth in ..
https://www.youtube.com/results?search_query=biotabs BioTabs Starterkit Introducing B..
BIOCANNA BioBOOST After years of field studies, in the primary rainforests of South Asia, Africa ..